Corn’s at its best straight from the barbecue. Take the charring as far as you dare: the smoky flavour comes through when you slather the cobs with spiced butter. Pull back the corn husks and carefully tear out the threads, then smooth the pale green husks back into place. Cover the corn with cool water and leave to soak for 10 minutes. Meanwhile mix the butter, salt, cumin seeds, chilli and thyme leaves together; set aside. 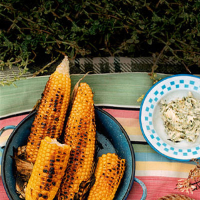 Place the drained corn over a pre-lit barbecue and cook, turning with tongs, for 10–15 minutes (or place under a medium grill for 10 minutes, turning regularly), until well-browned in places and tender. Peel back the charred husks, spread with a little butter and eat while still hot.